The Cincinnati Section is presently resurrecting, partnering with the very active ACS section in the area to assist with meeting venues and membership opportunities. We meet before the monthly ACS meetings a few times a year. The main goal for our section is to support local students in developing themselves as spectroscopists – supporting them with travel grants to our national meeting, SciX. We're looking forward to meeting up again at the CINTACS picnic. This year there will be tables from different organizations including the SAS Cincinnati section and the newly formed SAS Special Interest Section ADIS, Advancement of Diversity and Inclusion in Spectroscopy. SAS Cincinnati Section Members enjoyed a summer Happy Hour together in Wyoming, OH. Gloria, Adam, Celeste, and Anna discussed ideas for events such as a Brewery or Whiskey Tour, National Chemistry Week, more Happy Hours (of course! ), presentations and speakers, and trips to museums such as the American Sign Museum, the Oesper Museum, and the Llyod Library. We also discussed how to expand the student base and attract new members, especially from government. Please congratulate our new board! Get ready for the Spring! The new board will be planning an informal get together soon. We're also starting to plan our demos for the April 27th CINTACS meeting at NKU. If you would like to help out with demos/planning/collectin demo materials, please email Gloria Story. *Reminder: Electronic voting ends on Feb 16, 2016! SAS Cincinnati Section Elections for 2016-2017: January 16, 2016-February 16, 2016. Check your email for voting informaiton. Contact Anna Donnell for more details. A few members from the Cincinnati SAS section got together at the locas ACE section meeting (CINTACS) at Xavier University. The meeting honored the late Dr. Joseph A Caruso, a longtime member of the Cincinnati section and was a joint meeting with the National Organization for the Professional Advancement of Black Chemists and Chemical Engineers (NOBCChE). Gloria Story and Anna Donnell celebrate National Chemistry Week 2015 on local television! Gloria Story (SAS Secretary and Chair of the Cincinnati Section) and Anna Donnell (SAS Web Editor and Secretary/Treasurer of the Cincinnati Section) shared the cabbage juice/pH demo with folks at Fox 19 on Oct. 20th. The theme for National Chemistry Week this year is Chemistry Colors our World! How are you celebrating National Chemistry Week? Cincinnati Section members attended the SciX2015 conference and helped out at the SAS booth! We decided to celebrate the beginning of summer with happy hour! We do like to have a little fun now and then, but we also talked about updating our bylaws and ideas for future events! 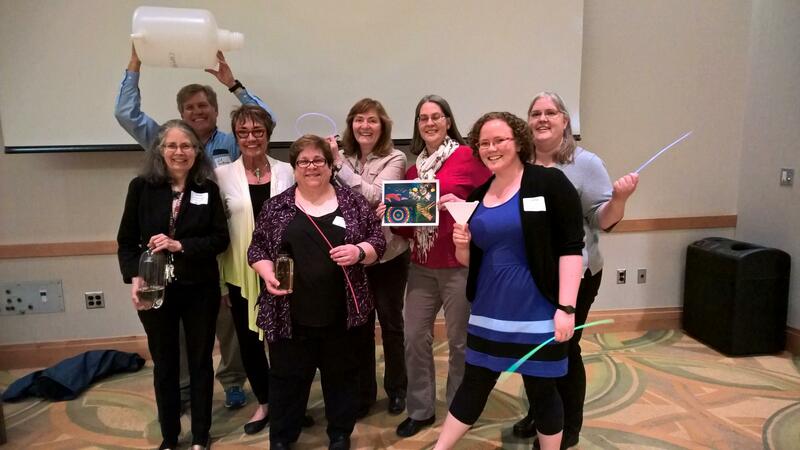 A team of Cincinnati ACS (CINTACS) and Society for Applied Spectroscopy (SAS) members held an educational, yet fun program focused on the International Year of Light (IYL) theme during the monthly ACS meeting held at Northern Kentucky University. At this particular meeting, the ACS recognizes local teachers and students for their exceptional work in Chemistry. As it happens, one of the Cincinnati SAS Section members is presently serving as the President of SAS, Diane Parry, and introduced SAS, the IYL, and a little history on Spectroscopy. The chair of the Cincinnati Regional section of SAS, Gloria Story, also lead a team of members in some really great demonstrations. Some were for the entire group to watch together (giant luminol spiral!) and some were be brought to the tables for a closer, more hands on approach (UV light and sunscreen, diffraction gratings, and spectroscopes!). Everyone had lots of fun using 3D glasses, glow sticks, lasers, and more! Members of the Cincinnati SAS section attended Pittcon and helped at the SAS booth! We met very informally at the December 2014 Cincinnati ACS meeting at Xavier University to discuss working to update our Constitution and By-laws, specifically so we can use email as our voting medium in the future. We plan to have a happy hour soon to regroup on this topic and others. We met before the local ACS meeting held at Northern Kentucky University. Two of our officers presented their perspectives on academic. One of our past SAS tour speakers, Dr. Charles Eads, spoke on Design and Analysis of NMR Relaxation Measurements for Understanding Complex Multi-phase Mixtures.